Bits and Pieces but mainly marbling! Look what I bought for half price last week! 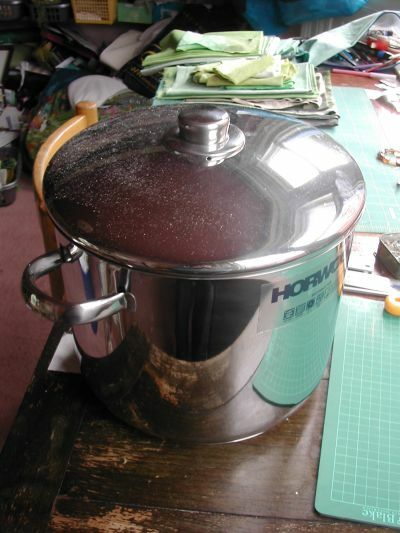 This is for doing some natural dyeing in – stainless steel so it doesn’t affect the colour and I can keep it just for that. 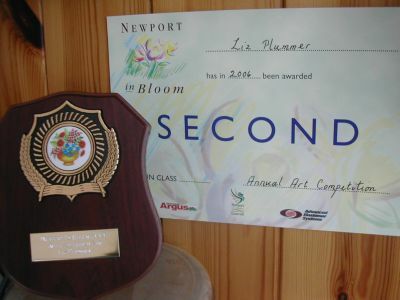 Remember I won second prize for my Transporter Bridge postcard in the Newport in Bloom art competition? Last Friday, they had an award ceremony and I got this certificate and the little shield and a cheque for £20!! This is a detail of the above. I did this on calico, which took the paints really well. 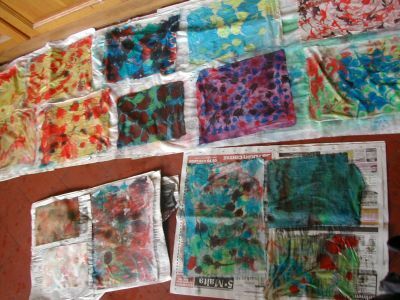 Here are today’s fabrics busy drying. 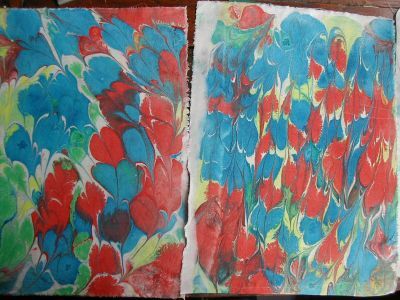 They are just a bit bigger than A4 size – I did the marbling in a large cat litter tray! Wow, that is really cool stuff. I have not heard of marbling paint. Where do you purchase yours? Is it online? That looks like so much fun. Thanks for the link on Gabrielle’s blog. It was an interesting post. What she said was much like what we discussed in a Process Arts Seminar I just took. Lovely marbling Liz. I’m off to read Gabrielle’s blog. Liz, I’m shooting from the cuff here since you posed the question about themes in your work…but not so much as themes but I’d say you prefer all over patterning in the length and width of a design…would that be correct? Liz, I looked at the Pebeo site. As it was France I figured shipping would be astonomical. 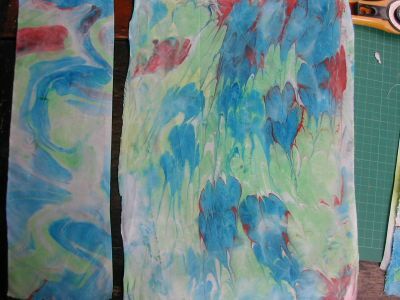 Then I looked online and found it with a company I have been buying my fabric dying supplies at for years. Duh. Sometimes I am so dense it is not believable. Thanks for the information. I have purchased a mini marbling kit so I can try it out. Now that our laundry room is finished and all my dying supplies are organized and in one place it will be a lot easier to play with the dyes again. Thanks again. Hope you are well. Liz, I love the marbled fabric. 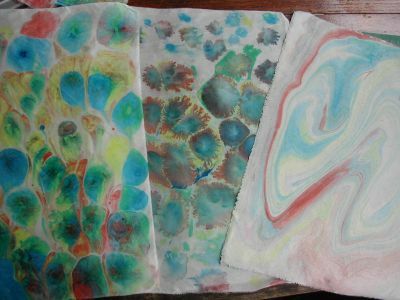 I marbled fabric years ago. What fun. You have inspired me to try it again! The fabric looks really interesting – I bet if you just leave them up for a while a theme will come. The answer so often seems to come when you are apparently not thinking about the problem at all. Saw your first marbled efforts. Watch out as it is very addictive! 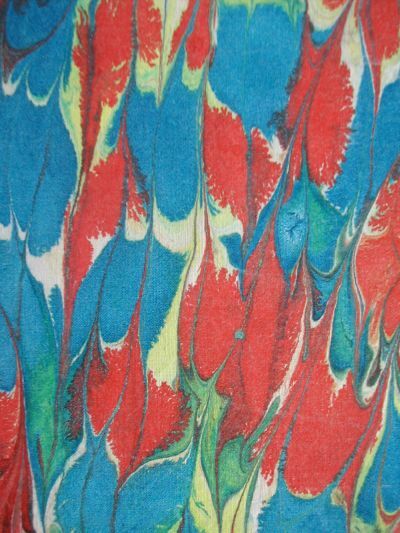 You can see how many days and entries I have made in my blog these days on marbling! !